Halamid is a very effective disinfectant for surfaces that come into contact with food and beverages and the ingredients used. The disinfectant powder is used in the food-industry and healthcare for the disinfection of floors, walls and other surfaces. 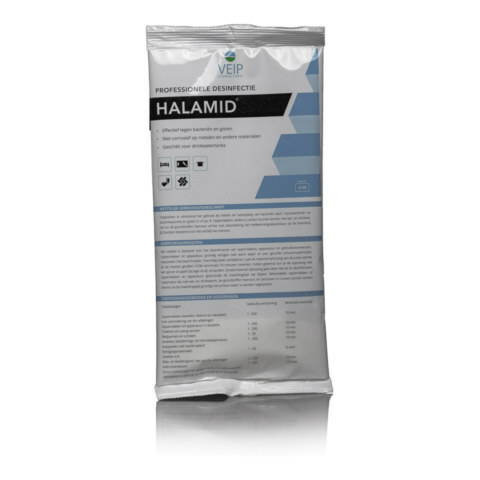 Halamid is a mild disinfectant with high stability for reliable disinfection results. Halamid is a disinfectant that derives its efficacy to bound chlorine and oxygen. The product is characterized by a high percentage of stable and active substance. Halamid causes a chemical reaction (in fact, a combustion reaction) with microorganisms. Resistance is therefore not possible. The strength of Halamid is the broad working spectrum and the relative mildness for the user, the materials and the environment. 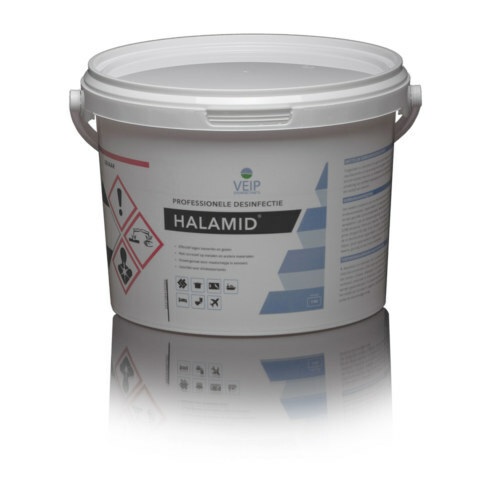 Halamid is packed in buckets and supplied including a scoop which dose easily and accurately. The disinfectant dissolves easily in water (maximum concentration of 10% at 15 ° C). Because of the mild nature Halamid is non-corrosive to metals and other materials. Use biocides safely. Before use, read the label and product information. Halamid and Halamid-d is the same substance but with a different admission text. Available in 25 grams, 1, 2½ and 5 kg packaging.